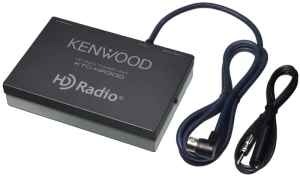 Connect the KTC-HR300 to a compatible Kenwood product and experience a whole new world of digital broadcasting. FM broadcasts sound close to CD quality, and AM broadcasts sound close to current FM. One of the coolest features of HD Radio™ is multicasting, or the ability to broadcast two or more programs simultaneously, giving listeners a much bigger variety of programs. KTC-HR300 is also capable of iTunes™ tagging with compatible receivers. iTunes™ tagging give the ability to tag a song (up to 50) and stores it to a connected iPod. The next time the iPod is connected to iTunes™ the tagged songs are displayed with the option to purchase them from the iTunes™ Store.